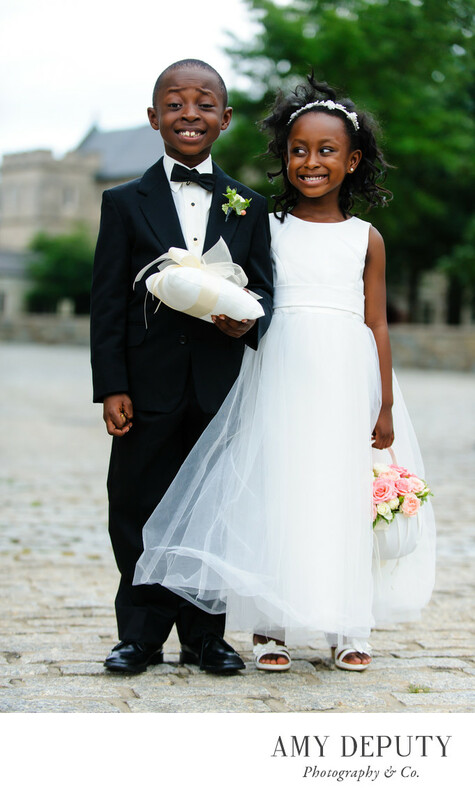 This photograph of a ring bearer and flower girl taken outside the Washington National Cathedral in Washington, DC falls somewhere between a posed photograph and a candid. I love the expressions on these two cuties' faces. They just make me smile. During my time as a Washington, DC wedding photographer, I have found that some children (and adults, too!) thoroughly enjoy hamming it up for the camera while others may get a little impatient or shy. My advice is always to relax and just be your self. The best pictures — the really great stuff — reflect what is real and true. I enjoy photographing a full spectrum of personalities and emotions, as they all bring forth these unpredictably great, funny, and beautiful one-of-a-kind photographic moments. Location: Washington National Cathedral, 3101 Wisconsin Avenue NW, Washington, DC.